Bald eagles belong to a scientific grouping of eagles known as sea-eagles or fish eagles. Although they don't have vocal cords, they use sounds to communicate. They produce squeaking and screeching sounds by pushing the air through the bones in their neck. Bald eagles are North American birds. Their range extends from the Mexico border through the United States and Canada. They are extremely populous in Alaska. Bald eagles build large nests. Largest known nest was 20 feet deep, 13 feet wide and weighed nearly 3 tones. Bald eagles are monogamous, which means that one pair of eagles stays together for the rest of their life. They are almost always found near water, on coastlines, lakes, rivers, swamps, and marshes. Young birds are dark in color. When they turn 5 years, they will start resembling their parents. Lifespan is around 20 years in the wild, with the oldest confirmed one having been 38 years of age. 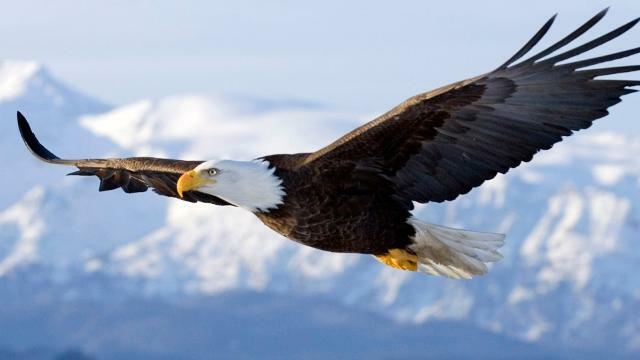 Bald eagle has been national emblem of the United States ever since 1782. In captivity, they often live somewhat longer. In one instance, a captive individual in New York lived for nearly 50 years. They live 28 years in the wild and up to 36 years in captivity. The bald eagle has a body length of 70 to 102 centimeters (28–40 inches). Bald eagle’s wingspan ranges from 1.8 to 2.3 meters (5.9 and 7.5 feet). They have excellent eyesight and see things 4-7 times better than humans. They are weight from 3 to 6.3 kilogram (6.6 and 13.9 lb). Females are about 25% larger than males. Bald eagles are not bald their head is covered with short, white feathers. The name comes from an old English word, “balde,” meaning white. Bald eagles breathe air using the holes on their beaks called "nares". Bald eagles can see 4 to 7 times better than humans. high in the sky or from a lofty perch in a tree or cliff ledge. But unlike humans eyes, an eagle’s eyes can’t move from side to side. So to look around, the eagle has to turn its whole head. Bald eagles can soar over 3,000 meters (9842 feet) high, and their great eyesight lets them see fish up to 1.6 kilometers (1 mile) away. When they attack, they drop down at up to 160 kilometers (100 miles) an hour! Then they glide just above the water, snag a fish with their feet, and fly off to eat it. Bald eagles will steal hunt from other birds or even humans (during fishing) thanks to their speed and sharp claws. Bald Eagles favorite food is fish. Other foods include: ducks, turtles, snakes, frogs, muskrats, squirrels, rabbits, fawns (baby deer), snails, mice and other birds. Bald eagles fly 35 miles per hour. When they "dive" through the air to catch the prey, they can reach 100 miles per hour. They eat fish, other birds, muskrats and turtles. Hooked beak helps them tear apart their prey. Most eagles are silent, except during the breeding season. But bald eagles are famous for their harsh, cackling call, which the birds use throughout the year. Bald eagles mate for life, but when one dies, the survivor will not hesitate to accept a new mate. During breeding season, both birds protect the nest territory from other eagles and predators. Their wingspan ranges from 5.5 to 7.5 feet. Bald eagles are monogamous but solitary animals, they spend winters and migrations alone. Bald eagles makes a large nest high in a sturdy tree, or sometimes on the ground if no tree is around. They come back to their nest year after year, adding more twigs, grass, moss, feathers, and branches to the original nest until it becomes huge. Adult eagles are 3 feet tall and weigh up to 9 pounds. Females are larger than males. The largest bald eagle nest on record was 3 meters (9.5 feet) wide and 6 meters (20 feet) high. It weighed more than 2 tons. When the nest is to the eagles’ liking, the female lays 1 to 3 eggs. Both male and female take turns keeping the eggs warm day and night until they hatch. Bald eagle females lay their eggs several days apart, once a year. The first eaglet (chick) to hatch gets an advantage over its younger siblings, since it has had several days to grow. It is not uncommon for the older eaglet to kill the smaller one, especially if the older is a female, as females are consistently larger than males. Both parents help care for the eaglets. The mother does most of the chick-sitting, and the father provides the food for the family. They have around 7000 feathers. They are light, but strong. Eagles feed their young by shredding pieces of meat from their prey with their beaks. By 3 weeks they are 30 centimeters (1 foot) high and their feet and beaks are very nearly adult size. At 6 weeks, the eaglets are very nearly as large as their parents. They turn dark brown just before they leave the nest at about 12 weeks old. Their head and neck feathers don’t turn white until they are mature. Native Americans consider the bald eagle and the golden eagle to be sacred. Bald eagles are not bald at all. Eagle looks "bald" because white feathers on the head are in contrast with dark brown feathers on the rest of the body. These graceful birds have been the national symbol of the United States since 1782. Bald eagles were on the brink of extinction because of hunting and pollution. But laws created almost 40 years ago have helped protect them, and they’ve made a comeback. In 2007, the bald eagle was removed from endangered and threatened species list kept by the United States Fish and Wildlife Service.